Toronto Limo Service is a premium choice for your luxurious transportation needs for any event accross GTA. Highly specialized and equipped with latest resources, we are specialized in catering the deluxe travel requirements of clients in corporate sector. Our diverse range of limo rental packages have assisted and facilitated many business organizations and agencies during their key corporate events. We believe in offering smooth and dependable transportation services that are critically administered by our most competent staff. One can experience ultimate sophistication and gracious ambiance throughout the travel by referring to our high standard services. Our proficient staff and chauffeurs are committed to offer finest quality of transportation solutions. We critically recruit and train our chauffeurs for guaranteeing the most efficient limo experience across Toronto. Catering each and every requirement of the clients is the prime concern of our company. Moreover, we truly encourage our clients to negotiate their requirements with the company representatives in order to assure nothing but the best. Toronto Limo Service is a premium transportation service provider, committed to supplicate the high standard travel demands of the clients across Toronto. Special limo rentals solutions are offered for airport transfers, hotel transfers and other corporate traveling events. Enjoy the most opulent, comfortable and safe limousine travel experience while on your way to airport or hotel with important clients. Top notch amenities including Wi-Fi connections, LED’s, Bluetooth connectivity, fully loaded mini fridges , leather sofas, LED lights and a highly gracious ambiance is offered to the clients for hassle free airport transfer. The proficient staff at our company truly understand the importance of time, thus timely managed services are delivered. We maintain the highest grades of safety in all our airport limo rental packages by endorsing all the current security rules in Toronto. Latest GPS tracking system and technological means are utilized in order to assure smooth, professionally supervised and comfy airport transfer experience. We offer something beyond mere style and comfort. Customized corporate transportation needs of the executive clients are served by maintaining high standards of professionalism. Highly comfortable and sophisticated ambiance is guaranteed to the clients, leading towards enhanced productivity. All types of executive travel needs are catered including corporate meetings, client meet ups, trade shows and other business travel events. We are always ready and equipped to serve your corporate travel demands by maintaining acute courteous, luxurious and safety trends. Timely managed pick and drop services are assured to the corporate clients and their guests. Our extremely well-trained and well-versed chauffeur staff is committed to go extra mile for delivering matchless corporate limo services across Toronto. Completely custom tailored and closely cooperated services are offered to valuable clients as per their exclusive travel requirements. We basically recognize the fact that every corporate client has its own set of criteria, which is being catered by our proficient team. Weddings hold special place in everyone’s life as these are the moments when all loved ones gather to cherish the happy times together. While weddings arouse feelings of happiness, joy, and elation they are sometimes most frustrating times for the family who is hosting the event. There are loads of chores to be done and numerous things to look after. The arrangements and preparations are tiring and create much chaos and mess. 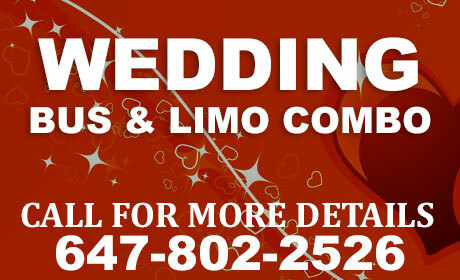 What Wedding Toronto limo does is take away the pain by delivering a seamless, grand, and stylish way to travel to the venue at best affordable rates. We excel in offering pocket friendly wedding transportation to a diverse client population in Toronto and allow them to ditch the hassles of booking multiple vehicles for guests, couple, and the host family. We are expert in designing exquisite wedding limo and party bus rides for couples and our chauffeurs have been trained well in customer etiquette so that the passengers can relish a safe, secure, and luxurious ride. Both vintage and latest model cars are available that can be altered and renovated as per the theme of the event. We provide red carpet roll out facility as a complimentary feature within each of our wedding limo deal. Our chauffeurs stay with clients all through the event and drop them off to their wedding suite in a much prestigious and graceful style. We make our clients feel privileged by letting them walk over a red carpet rolled out exclusively by uniformed chauffeurs. All our limos and party buses are packed with exciting and latest technology features and facilities to make them enjoy their royal ride to the fullest. Make your wedding day a truly memorable experience by choosing to travel with Toronto Limo Service. We promise to deliver a supreme class limo and party bus rental service that is going to elevate the class and grace at your very special event. Contact us today to get more details about bookings and free of cost price estimates. Prom is a much treasured event in every person’s life and we make this special event a bit more worthwhile by presenting to residents of Toronto, a mesmerizing limo and party bus rental service. We have been rendering quality transportation facility for high school and college proms and our experience in the industry has helped us translate customer requirements into astounding transport solutions. Whether you want to take your partner in a mystical ride or want to experience a thrilling journey along with friends, we are here to make your prom a truly ravishing event by providing deluxe class Toronto Limousine rental facility at reasonably priced rates. 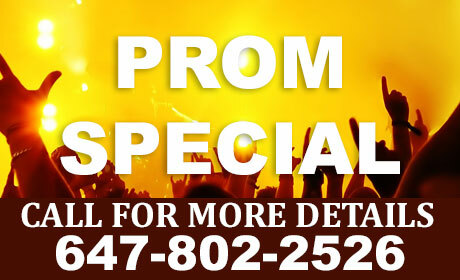 Parents can now take a sigh of relief as their teens can now travel to prom night in a safe, secure, and reliable ride. Prom Limo Toronto have installed vehicle tracking and GPS systems in all our limos and party buses and we monitor and track every vehicle to ensure maximum safety of the passengers. Relish every second of the journey towards the prom in Toronto as all our vehicles are packed with bunch of entertainment features including stereo sound system, woofers, internet connectivity, premium drinks, light snacks, plush leather seats, and climate control systems. With a wide range of limos and party buses available on board, we welcome clients to experience fun packed rides around the Toronto city and impress friends and fellows. Make a celebrity style entrance by stepping out on red carpet and walk down with your gang of friends leaving a lasting impression on those around. Our skilled managers can be contacted any time for making special arrangements on requests. Clients can also choose from a range of prom night packages available online or create their own unique package via seamless online facility. Prom Toronto Limo have employed a team of expert technicians who service and tune up all our vehicles on regular basis to ensure flawless performance. A special event needs to be celebrated in a special way. That's why "Toronto Limo Service" presents a wide array of commendable ground transportation solutions for making your special events cherished for life. No matter what the occasion is, we are always there to serve your demands in the best possible manner. Working with a highly focused vision, our virtuoso team is ready to offer customized limo and party bus rental options to the customers. Our company takes the pride of presenting an assorted fleet fully furnished with latest amenities that will hit the esthetic taste of the clients across the Toronto. 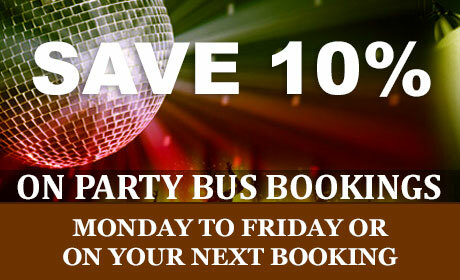 Ranging from intimate to grouped party rides, we have a suitable package plan for every type of demand. We have reached par excellence in meeting the customer satisfaction through our unmatched limo and party bus services throughout Toronto. The most professional and hospitable attitude of our chauffer team has actually made us stand out in the crowd. And you must try it to believe it. Toronto Party Limo is committed to deliver comprehensive ground transportation solutions including party planning, décor setup and managing a secure yet entertaining ride for you and your valued guests. 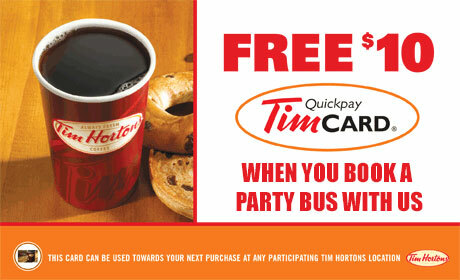 Toronto Party Bus Rentals serve complementary drinks and snacks to amuse the clients in a pampering way. High end stereo system, party lights, LED’s, commodious ambiance and comfortable seating capacity will surely set a perfect basis for experiencing a joyous party ride. The entire limo fleet is also available online and can easily by accessed 24/7 by visiting the company website. For getting quotes and further inquiries, the clients across Toronto can contact us in confidence. The distinguished customer services staff is ready to accommodate your issues on immediate basis. We have always added hues of personal touch in each of our limo and Toronto Party Bus rental project and attempts to build long term relations with the clients.